Employees are not robots; they just can’t work 365 days a year without a break. Taking some time off work to take care of personal issues often helps an employee to relax more, improve their performance, and deliver the best results at the workplace. Leaves often break the work cycle by part, enabling an employee to divert their attention a little and focus on other important matters, either personal or pretty much work related. If you would like to take some days off work, you can use the Request Forms to communicate your interest with your employer. No matter how bad you don’t want to come to work for the next one week or so, you must request a leave from your employer. 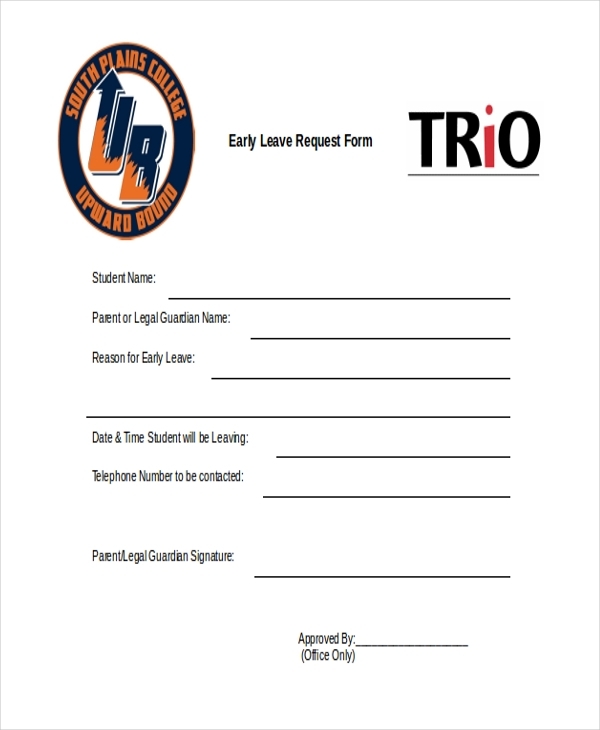 To request the leave, download this form, fill it out, and then send it to your employer for reviews. Expectant mothers should always take leaves a few days before the delivery date. To take a maternity leave, download and fill this form, and then send it to your employer for review. Your employer should concede to your request within the shortest time possible. You may also see Vacation Request Forms. You can’t continue working if you are sick. The best thing to do is to request your employer for a sick leave. You can then use the time given you to seek medical attention and then you can come back to work after recovering from your illness. It is necessary to ask for a leave from your employer if you don’t intend to come to work for the next few days. 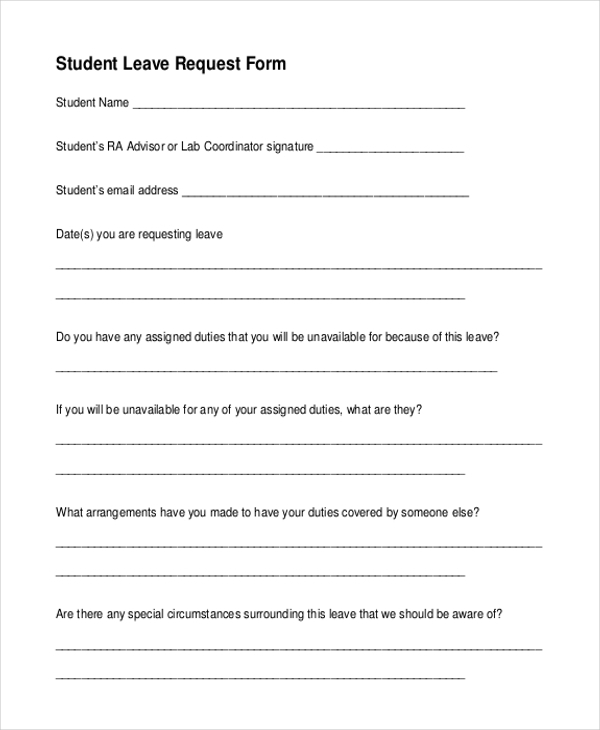 To request for the leave, fill out this form and then submit it to your employer as soon as you can. 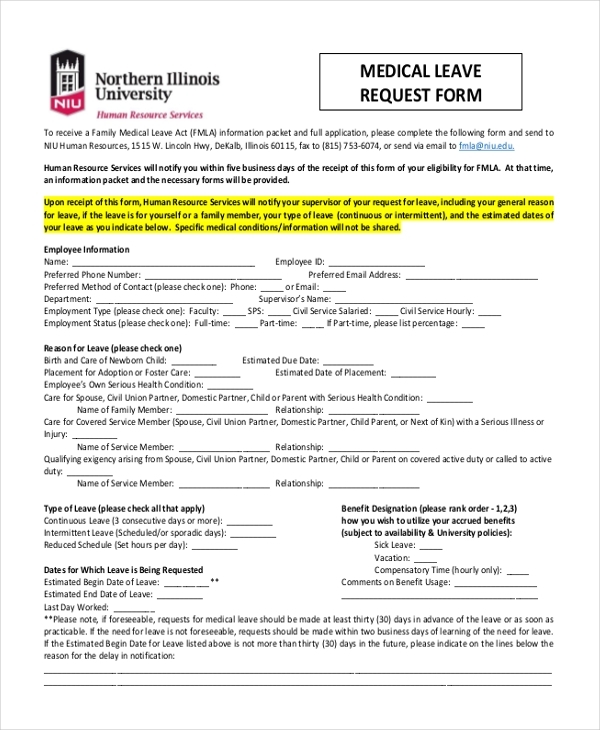 A medical leave request is a form filled by an employee who would like to request a leave because of their health conditions. You should fill the form accurately so that your employer will not decline your request. You can also see Donation Request Forms. An extended leave form is for employees who are already on leave but would like to stay away from work for a little longer. 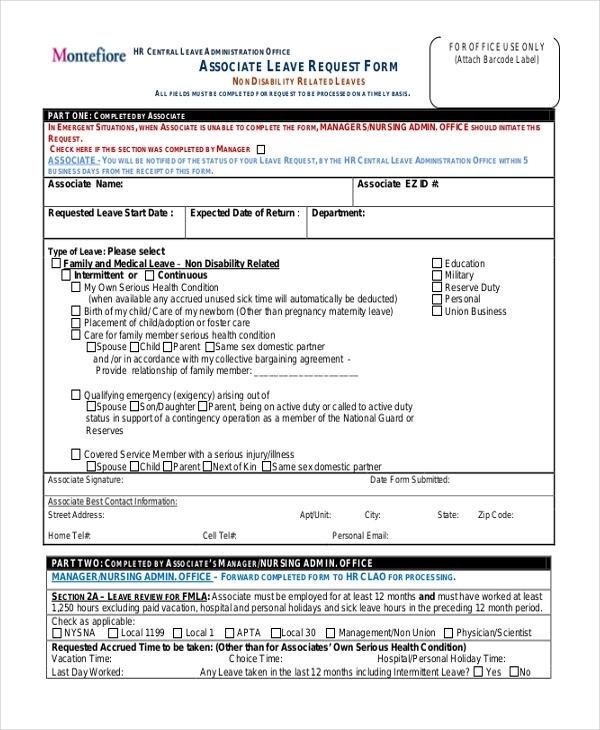 Use this form only if you are sure you would like to extend your current leave. Your employer will review the document and provide you with the necessary answers. An associate leave request form is for those who have an association with a business in which they work as part-time or full-time employees. Fill this form is you would like to be away from your workstation for a few days. Asking for an early leave makes your request known to your employer before the actual date of the leave. If you would like to ask for some time off work earlier than usual, you should use this form. You may also see Event Request Forms. 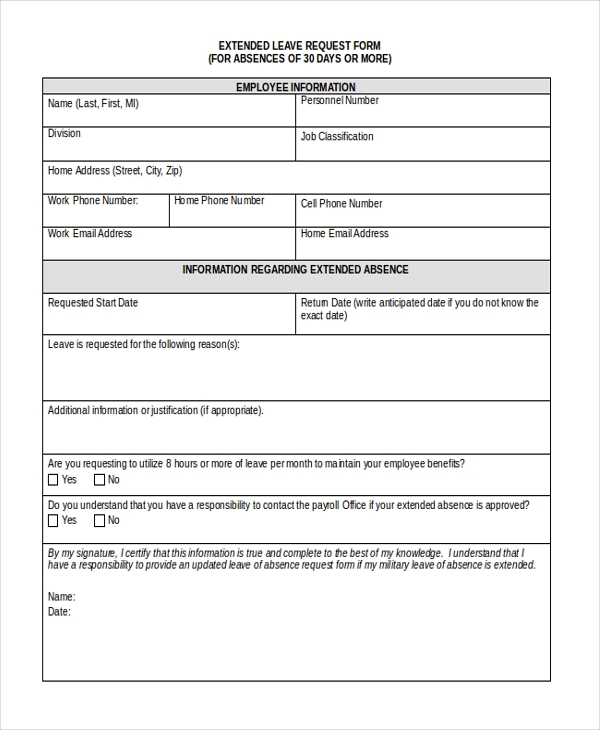 If you are working and schooling at the same time, you can use this sample form template to request for some time off work. 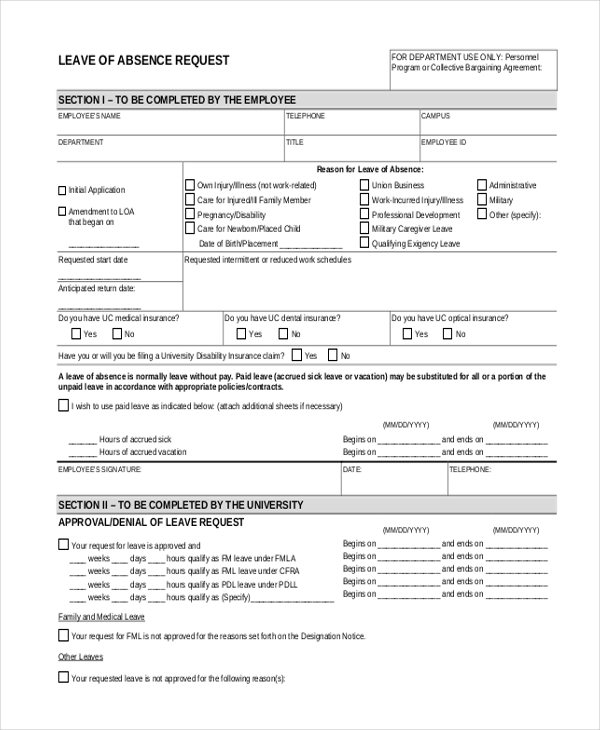 This form is specifically for students who also double as employees for a particular company. Military people need time off work too. Regardless of the fact that they are always in the field protecting the country and its citizens, they, too, can seek for a leave from the place of work. 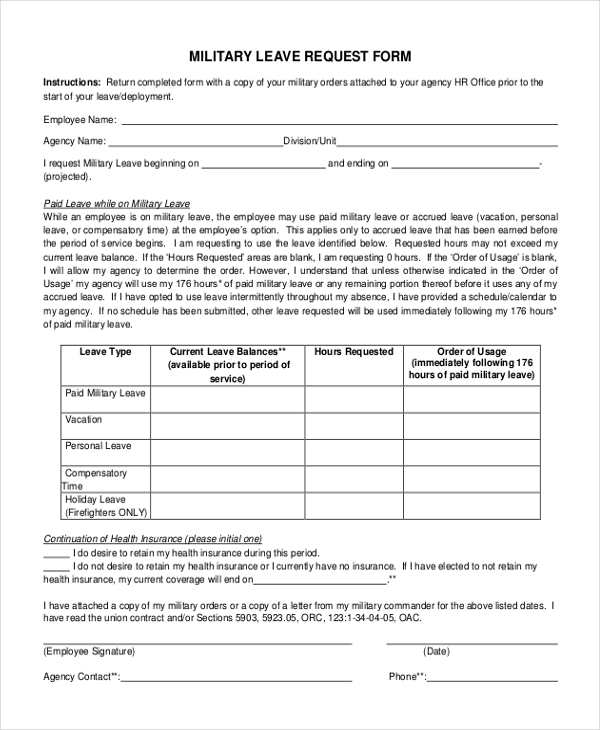 If you are a military worker and you want to request a leave, use this form. Who Uses This Leave Verification Form? 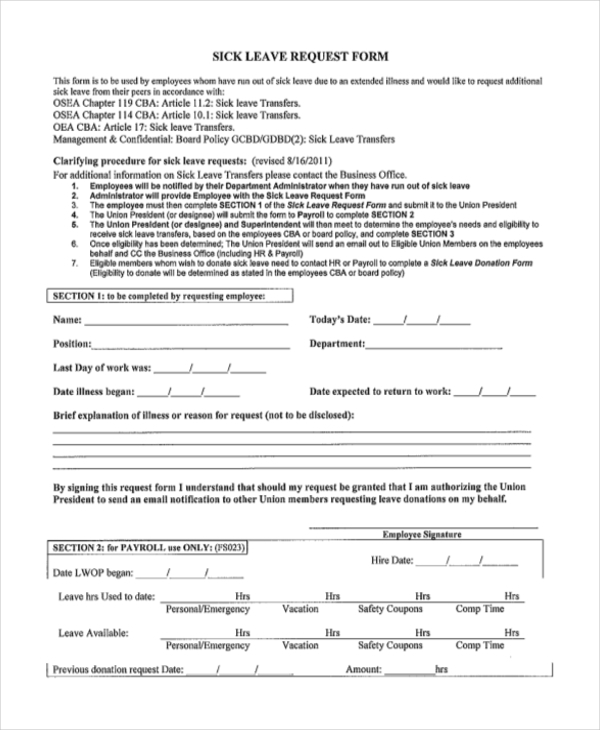 Leave verification forms were designed to help employees ask for early or extended leave from work. They have been in use for a long time now. And of course, companies put more value on them because of their significance. At the end of the day, an employee deserves to have a leave, and that is why these forms exist on the market. You may also see Service Request Forms. Pregnant women can use the forms to request early maternity leave from work. Employees who are on leave can use the extend leave forms to request for an extension of their leave. You can use the form to request for an early leave before the actual date. Of course, you’ll have to give reasons why you need an early leave. The availability of these forms makes it easy for employees to ask for leaves without straining to create the sample files from scratch. A leave form saves you a lot of time at the end of the day. Because the sample forms are free to download, you can bookmark this page, come back to the page letter, and download the form whenever necessary. Leaves are very important, and that’s why every company has a leave policy in their terms of employment. It is best to ask for leaves when you necessarily need one, although your company will tell you more about how many days per month you can be off from your place of work. Leaves are periods for attending to your own issues, so make good use of the time. You can also see Transcript Request Forms.